Since these are flash cartridges they are in theory writeable, which would make them useful for, for example Little Sound Dj or other homebrew software. However, writing to them has proven difficult. The currently only known way of writing to them is with a software called FMGBx by Mootan. The program works but requires flasher hardware that is difficult to get and and in all cases are using an LPT port interface. Options include Bungs GB Xchange, a modified GBA flasher and two homebrew solutions using discrete 74hc logic. Clearly, there’s room for improvement. Rez is a unique synthesizer program for the Nintendo Gameboy. It crudely simulates a resonant filter in a way inspired by the resonance algorithm used by the Casio CZ series phase distortion synthesis. Whether I’ve come close to this type of synthesis, I leave to the users of the program to decide. It can both produce sounds meant to emulate this effect, and sounds more reminiscent of a hard sync oscillator. It also produces a graphical pattern on the Gameboy screen. During the development of this program, I’ve encountered a number of subtle issues with the DMG hardware, which you can either see as bugs or charming features of the hardware being (ab)used. What should you run it on? Rez is intended to be used on real hardware, in particular on a DMG, the original “brick” variety of Gameboy. If you wish to use an emulator, BGB and Gambatte are good choices. Honorary mentions go out to no$gmb, TGB Dual and smygb02 for sounding glitchy in ways that may be interesting, even though they sound nothing like intended. In this version, the controls are simple. Up and down control the “resonant frequency”. Left and right control the “fundamental frequency”. Currently, the synth is not tuned to any scale, so you need to manually tune it if you wish to use it with other instruments. The values of these parameters are shown on the screen: The four hex digit value is the resonant frequency and the two hex digit number is the fundamental frequency. A and B toggles between different waveforms which gives the resonance a different character, from relatively smooth to harsh to a hard synced sawtooth oscillator. On the far right (press A you can’t get any further) there’s a clean sawtooth waveform. This waveform is unaffected by the resonant frequency setting and may be useful for tuning the fundamental frequency to another instrument. There’s a bug in the DMG hardware which sometimes causes the waveform stored in the channel 3 wave RAM to be corrupted. You can press start to enable a workaround for this issue, at the expense of a slightly different timbre. You may also choose to leave this off which randomly and radically changes the waveform. Pressing select shows the current contents of the wave RAM. This is a debug feature that I used to debug the wave RAM bug. It may be of interest if you’re curious. All buttons can be used simultaneously. TIP: Find a “sweet spot” resonance and fundamental setting and alternate between holding left+up and right+down. This increases one setting and decreases the other. This can give some nice effects. I have plans for more features for Rez, including among other things better ways of controlling the parameters. I don’t want to promise too much yet, but MIDI input support (using Arduinoboy or Nanoloop MIDI-USB) may be plausible. But I felt that I wanted to get a version of this out the door to avoid tweaking the program indefinitely and never releasing it. Rez is not shitwave 2. Don’t believe the rumors. (Early) sound sample on SoundCloud, during development. Better sound sample by Victory Road showing more of what Rez can do. This image has been going around Facebook lately. What is the answer? Here’s a quickie: PixelH8’s Gameboy tools are known to crash when used on a real Gameboy with flash cartridges. The cause of this is a simple programming mistake that I was able to fix easily, so here are patched versions of the four Gameboy ROMs. Out of the tools, I personally find Deathray to be the most interesting, as it can create some harsh and unique tones that are worse than Shitwave. If you happen to own one of the originally released cartridges, I’m interested in knowing if there’s a difference between the “free” versions and the retail version. 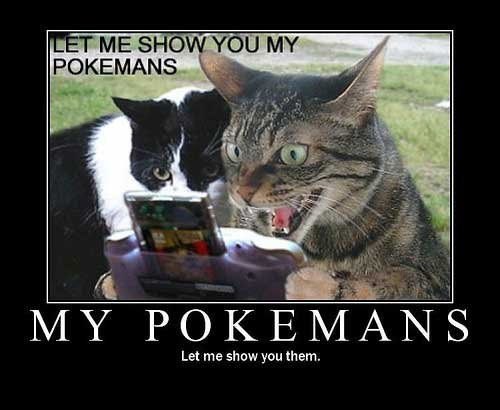 Or even a ROM dump. Today the Handheld Heroes compilation was finally released. It comes in two versions, a digital download version with only MP3’s (or whatever formats Bandcamp offers) and one physical DVD version with a number of extras. One of those extra items is an LSDj ROM with four of the songs from the album in an LSDj player that I made, as well as a funky menu to select a song from. The player stores the songs in ROM space and does not require SRAM to work. The video above contains a short demonstration of this ROM. Today BGB 1.4 by beware was released. 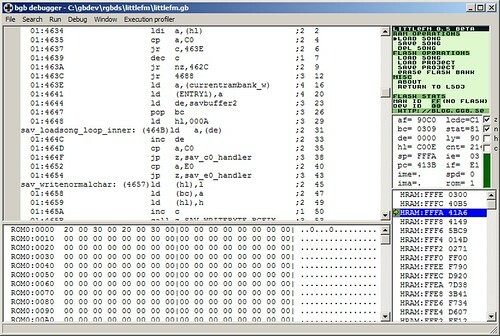 BGB is a Gameboy emulator and debugger. BGB 1.3, released little over a year ago focused mostly on emulation accuracy. It was the first update to BGB for 5 years and brought BGB past KiGB (which is actually a “compatible” emulator rather than a terribly accurate one, despite bold claims.) and up to par with Gambatte. My personal interest in BGB is mostly the debugger. My choice, before BGB 1.4 existed, was between no$gmb, which had the better debugger, and BGB which had the better emulation. After a lot of persuasion, I managed to get beware to implement a number of debugging features, some of which existed in no$gmb and some of which were new requests. The big new debugger features are support for debug symbols and an “online” assembler which allows you to immediately start typing instructions or data to be assembled to the cursor position. Plus a big number of bug fixes, small improvements and optimizations in all areas of the program. One noteworthy feature (which I’m not personally is not very interested in) is improved link port emulation for games. In particular, pawkemanz linking now works reliably, as do Tetris and LSDj. And lastly, an invitation to anybody interested in Gameboy development: please join the IRC channel #gbdev on EFNet. Everybody is so negative about SOPA and PIPA and ACTA. Nobody sees the opportunities! In the US legal system, plaintiffs who can prove willful infringement are entitled to up to $150,000 per work in damages. Let’s make a conservative estimate that a million Americans have downloaded 100 songs each. This would mean potential damages of $15M ($15,000,000) per person. Across a million people, that’s 15 million million, or 15 trillion US dollars in damages. What does this number remind you of? You’re right, the US gross public debt. So hear me out on this modest proposal. Use this money to pay back the public debt. Then give each of the million people a 400 year prison sentence (not unheard of in the US) and let them work their asses off for 400 years to pay back the debt that is now on their shoulders. (Should anyone try to die from natural causes prior to the end of the sentence, you simply threaten to kill the person in question, which is usually enough to make him or her want to stay alive.) Putting another million people in prison won’t even double the US prison population, so the relatively small increase would hardly be a strain on the American correctional supervision system. It’s doubtful whether anyone could object to this modest proposal which would instantly solve the two biggest problems America is facing today, copyright infringement and rampant public debt. As has already been established, Korg monotribe is MIDI capable. Howver, it is still limited with regard to certain things, such as being able to use more than 8 seqeuncer steps for the synth part or using a filter envelope separately from and LFO. All things that should be very much technically possible on the microcontroller device in the unit. One thing I’ve considered is to modify or even rewrite the firmware of the ‘tribe. Apart from the obvious work of actually rewriting the firmware, you need a way of flashing it onto the device. And preferably a copy of the original firmware, so the ‘tribe won’t be a useless brick until development is done. The microcontroller in the monotribe does support JTAG, a protocol for reading and writing firmware data, among other things, but this function may be locked down for security reasons. Korg recently announced the 2.0 firmware for the monotribe, which actually gives you 16 step, velocity control and a few other new features. More full information and download available on Korg’s homepage. Below, I’m posting the first step towards that goal, to extract the firmware image from the audio file. First, a big thanks to Th0mas for doing the initial groundwork of figuring out how the data is encoded. In fact, my code below below relies on having a transformed and cleaned up version of the audio data. I recently bought an IKEA spotlight. (JANSJÖ Clamp spotlight, product number 80163192) For fun I tried cupping my hand around it in a dark room to make the light shine through my hand. I could see my own veins. Pretty cool. 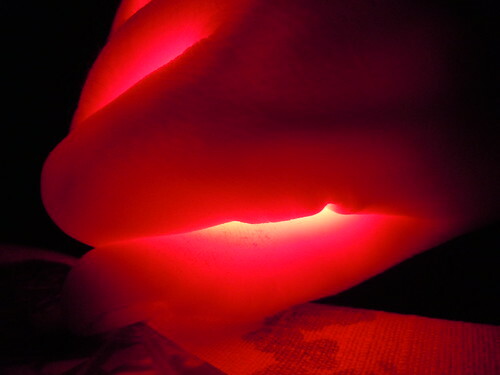 I used to this with flashlights as a kid, as well. An untitled collaboration between Simon Mattisson and Marcus Olsson. 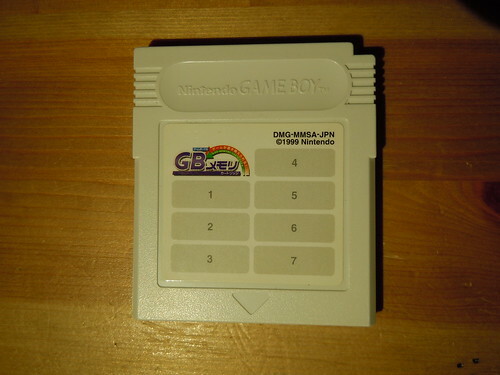 A Gameboy in a dark room is overclocked until it crashes. I’m almost getting Saw vibes from this. The Gameboy is modded by NeX and is actually being overclocked. The sound is produced by Shitwave. Untitled from _-_- on Vimeo. This page was previously hosted on http://gameboygenius.8bitcollective.com/wordpress/category/uncategorized/page/2/ (*).